Tet flower market always open up from the ceremony Kitchen God (23 December lunar calendar) until’s Eve. Flower market is crowded, bustling from morning to evening. Those who take the flowers are elegant dress. They come not only not fair to buy flowers but also to watch flowers, watch people. This ancient image of the young women go on Tet flower markets and the girls selling flowers are planted in the hearts of the guests love beautiful and romantic. 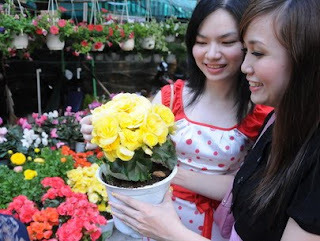 Flowers fair all excellent flavor, look, meet and satisfy customers enjoy the spring. People of North who prefer peach blossoms. Peach blossoms has several categories: white peach, pink peach, light red peach, … As the old area, peach blossoms in the left wing than the evil, miasma. 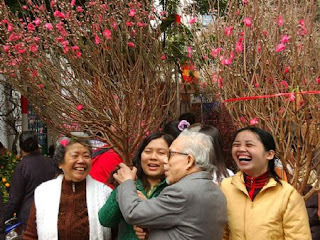 So, peach blossoms is indispensable in the traditional Tet holiday in the North. Stylish people that choose topeach blossoms both wings look pretty much just a smile, young buds to play to a Jan, but at the same time it must know the flowers bloom at the right pressure on the new year. Arts grow peach most famous plant in flower Nghi Tam village, Nhat Tan (Hanoi)If flowers symbolize excellent spring of north, apricot blossom is the specialty of the Southern spring. apricot blossom has many categories: four seasons apricot blossom, white apricot blossom, gold apricot blossom, But more common is the gold apricot blossom.Apricot blossom have 5 petal but also some species have special seven, eight petal, even to ten petal. Apricot blossom is light fragrance, gentle. Flower petals smooth as silk. Apricot branches dark brown, short, sturdy but looks full the thin, soft. Apricot blossom represents the high virtue, sence of perposes and uprightness like life is inspiration in poetry, music. There is a difference between the apricot blossom and peach blossoms, this is the scent. Peach blossoms without flavor, is also flowering apricot scented gentle, secret very elevated. Chrysanthemum flowers are also a favorite. There are many kinds of chrysanthemum: yellow chrysanthemum , white daisies, landmark chrysanthemum, eyes buffalo chrysanthemum … Daisies have special both beauty and flavor: pure and upright, secret, but long-lasting then chrysanthemum often symbolizes freshness life, humble. Roses are flowers nobility. It is usually for a queen of flowers. Roses integrity both flavor and beauty. Have flowers pink gold, white, red … Red rose like dark red velvet, to petals, smooth and aristocratic. Gold rose luxury, the radio. Rose is a symbol for love. The rose always arrange with other flowers that create nice flower vase to place in living room.Can not not mention the wonderful flavor identity on orchids in Tet. Orchid flower is by nature the perfect gift for a variety of colors, fragrance enchanting heart. Orchids elegant freshness. They play lan, initially only knows the form of flowers, gradually understand the spirit of flowers. He has reached the peak of art. Narcissus is a precious flower, which originated from China. Play narcissus requires meticulous, and for any refinement. Narcissus is white smooth, bloom into brunch with gentle fragrance and bloom right on as you like. Marine body should have the right in balance clade, cluster roots and white silky stout soaked in transparent glass. In the days of spring, beside flowers above its excellent, blueberry is also one of popular trees. Blueberry are grown in flowerpots, trimmed to the layer, the leaf canopy very elaborately, demand period. 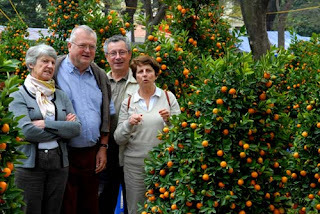 The best cranberry tree is precious small tree, but much too small, big fruit, yellow round tree. Yellow of blueberries symbol fortune are so many people favorite.When spring come, the flowers are showing fresh and beauty flowers make people enjoy the flowers have seethe heart . Flowers appear in spring embellish for natural, life and joy, the desire of the heart. 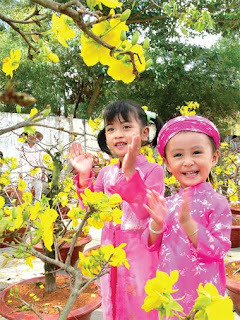 It is the homeland of the soul, nature, people in the Tet holiday. In the light cold the rest of the day last winter to spring, people listen heart, slogan and vibration , underwent heart out to enjoy the beautiful flowers, very early of land. Playing flowers, enjoy the flowers into a unique culture of the East.